When the Boone Central/Newman Grove Cardinals were finally able to hit the track for their initial track & field competition, it didn’t take long for them to make an impression. After the scheduled season opener – the Madison Invite – was called off due to weather conditions, BC/NG welcomed four teams to the Boone Central Sports Complex Saturday for the annual Mansfield Invitational. Before the day was finished, Cardinals had chalked up victories in 17 events and established three new school records. Card Coach Kris Pestel felt it was a very productive start for her squads. “We had a pretty good day Saturday,” Pestel acknowledged. “Overall, we were able to start with some great marks, and now we’ve established a starting point to build on for the rest of the season. “There were no team scores kept in this meet, but the girls were able to win seven events and the boys won 10 events. We also started our season with three school records! “Damian Backus broke the Boone Central long jump record, going 21’5. That record was previously held by Zac Glidden. 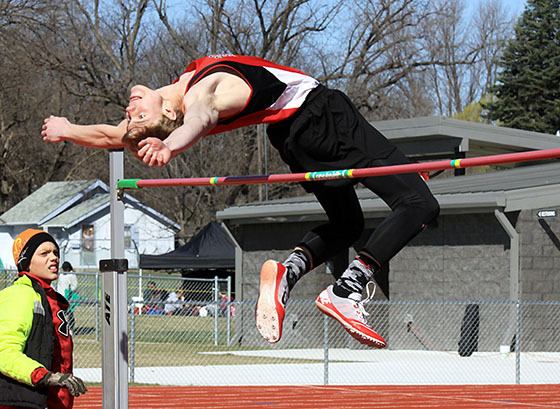 Jared Zwiener broke the Boone Central pole vault record previously held by Jared, Matt and Joe Brugger, by going 13’2. Celine Dunlap also broke the Newman Grove pole vault record she already owned, going 9’10.